I would like to extend my gratitude to ISEA for awarding me the student engagement award. As I conducted an unpaid research project for my honours thesis in Tokyo, Japan for three months, the award most definitely helped me to cover Tokyo’s expensive living costs and allowed me to focus on my research. I was accepted to do my thesis project in Sophia University, Japan at Dr. Takehara’s laboratory. 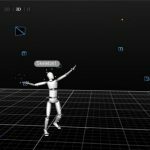 The project was designed to determine wrist acceleration during a forehand overhead smash in badminton using a wrist mounted accelerometer and motion capture cameras. The results were used to determine which type of badminton racket best suited individual elite and novice players based on the consistency of the racket velocity. Through conducting trials, I calculated peak acceleration during smash shots and examined the consistency of the acceleration. Among other things, results indicated that experienced and novice players performed the fastest and most consistent smashes with rackets that had an evenly balanced distribution of mass. As this was a short-term project, further research was suggested to investigate the outcomes employing a larger number of trials and subjects. 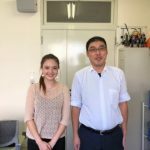 The experience working as a research engineer in Japan gave me insight into the world of engineering outside of the context of coursework at university. Working at Dr. Takehara’s laboratory, I was given the opportunity to recognise how exciting and broad the field of engineering is. I believe research/engineering is a field that brings individuals as well as nations together, as we all seek for one thing – a better future through education and knowledge. The experience of conducting research in Japan has inspired me to pursue engineering opportunities in different countries. After graduating I hope to gain employment abroad and to use the skills I have obtained through studying and research to contribute to the field of engineering as a professional engineer.